The Simmons First Online Banking service is provided free of charge for all Simmons First Bank clients. Using this service, you can make payments online, transfer funds from one account to another, and receive notifications and online statements on your mobile phone. In this article, we will outline the main steps you need to take in order to complete the Simmons First online banking login and the Simmons First online banking mobile login for the Simmons mobile apps. Go to the Simmons First webpage, simmonsbank.com. In the upper right corner, locate the online Banking login menu. 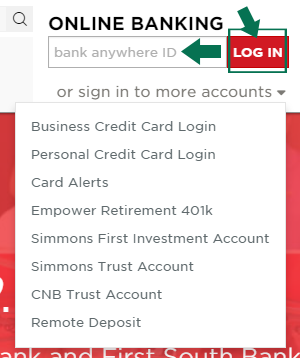 Type in your Simmons First ‘Bank Anywhere ID’. This is the Simmons First equivalent of a user ID. Press the red button marked ‘Log In’ next to the Bank Anywhere ID field. If you want to sign in to a different account type, choose the appropriate one from the drop-down menu. Fill in your User Name and Password for that account in the login menu that appears. Click the ‘Sign On’ button. The Simmons First online banking service can also be accessed from mobile devices. To login to your Simmons First account from your phone or tablet, follow the steps described below. Choose the account you want to access from the menu. Write your ‘Bank Anywhere ID’ in the top right login box or User ID and Password as needed. Press the Log In button next to the menu to verify your login details and complete the sign in process. You can also access your Simmons First account using the online banking app provided by Simmons First. The mobile app is available for Android and Apple devices. In the following sections, we will discuss the login process for each app version. Find Simmons First online banking mobile apps. The apps are available at www.simmonsbank.com, in the Online & Mobile Banking section, or at the Apple App store. Choose between the iPad version of the app and the iPhone app, depending on the device you want to use. Download and install the Simmons online banking mobile app. Tap the Simmons First app. Write your ‘Bank Anywhere ID’ in the blank field. Tap the black ‘Submit’ button to view your account. Go to www.simmonsbank.com, in the Online and Mobile Banking section, or Google Play store and download the Simmons First online banking mobile app. Install the app on your Android phone or tablet. Tap the Simmons First icon. Submit your ‘Bank Anywhere ID’. If you have any trouble during or after the login process with your Simmons First online banking account, contact Simmons First customer support department. For issues related to online banking, you can send an email to the dedicated department, at bankanywhere@simmonsbank.com. Alternatively, you can call Simmons First customer service at 1-866-246-2400. We hope this guide will provide you with all of the information you need to successfully access your Simmons First online banking account. If you have other questions related to the Simmons First online banking service, you can also take a look at the Simmons First online banking FAQ page. The FAQ pages covers a wide range of common online banking issues. If the problem you encountered is not covered in the FAQ page, contact Simmons First customer support at 1-866-246-2400 or by filling in the online contact form available at www.simmonsbank.com, in the Contact section. Your app is terrible, cannot get in with my password that I’ve had for years. I read app comments and noticed a lot of other people are having the same problem. You need to fix that. Quickly. Have you tried contacting Simmons customer service department? This sounds like a pretty big issue.